Rediscovering a “maverick” female artist from the ’70s . 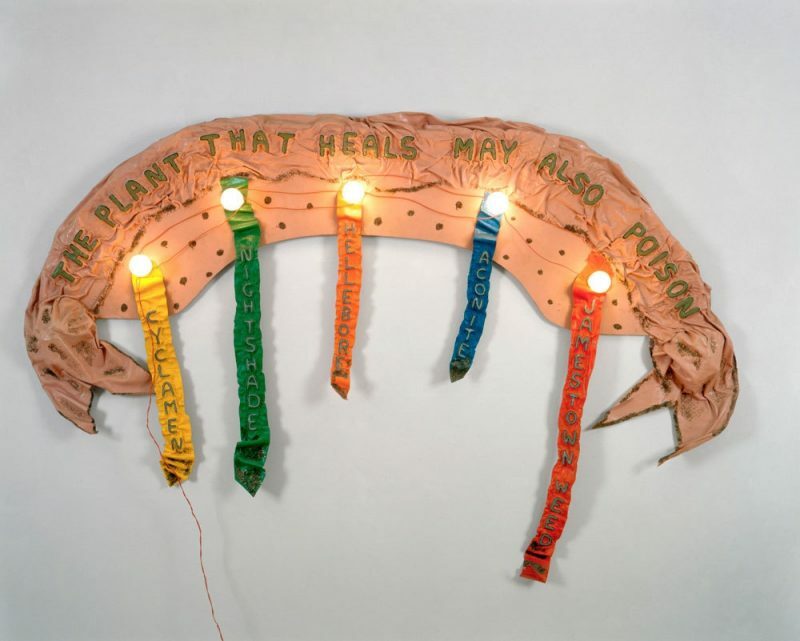 Ree Morton, The Plant That Heals May Also Poison , 1974. Enamel and glitter on wood and Celastic; five light bulbs. FWA—Lieve Van Gorp Foundation for Women Artists. Courtesy Alexander and Bonin, New York, and the Institute of Contemporary Art at the University of Pennsylvania. © Estate of Ree Morton. Ree Morton: The Plant That Heals May Also Poison, curated by Kate Kraczon, Laporte Associate Curator at the Institute of Contemporary Art, Philadelphia, is the first retrospective of Morton’s work in the United States in nearly forty years. Kraczon’s presentation is a bijou of an exhibition that focuses on Morton’s mature works produced between 1971 and 1977, the year of her untimely death. The show is compact and intimate, displaying over forty artworks within the museum’s first floor galleries. This tightly curated exhibition brings together Morton’s profound and deeply personal work as if in an embrace. The sitelines of the exhibition and the works’ proximity to each other generate a dialogue around Morton’s formal interests and developments, while also acting as a physical timeline of the artist’s last years working in Philadelphia, California, and Illinois. In a 1981 review, Lisa Leibmann described Morton as a “maverick,” and no better word can be used to encompass her singular practice. Working at the cusp of Post-Minimalism, Morton used unconventional materials in her sculptural installations, creating work that was pointedly nonconforming to the standards and goals of the Minimalist sculpture that preceded it. Her drawings and sculptures reveal a playful penchant for materials, words, and forms far less severe and rigid than those of Minimalist artists. In her review, Liebmann describes Morton’s career in three phases: first, that of mapping ( Souvenir Piece, Sister Perpetuas Lie [both 1973] ) ; second, an embrace of myth and drama ( To Each Concrete Man  , not exhibited); and finally, her discovery of Celastic and penchant for a baroque aesthetic ( The Plant That Heals May Also Poison  , Signs of Love  , etc.). While this trajectory is evident throughout the exhibition, one first encounters its titular work, The Plant That Heals May Also Poison , as a testament to Morton’s experimentation with Celastic and its noticeably artificial qualities. Juxtaposed with wallpaper depicting a dense pattern of African animals hangs a pink Celastic ribbon from which five multi-colored ribbons dangle, lit with light bulbs and labeled as various poisonous plants. The piece embraces kitsch, but in a manner that is imitative, referencing its characteristics in order to distinguish it. What Morton presents is an ambiguous and poetic installation, the forms of which are specific (ribbons, animals, signs) yet also mysterious in their relationship to one another, posing individual interpretation as a kind of secret game or visual pun. On a formal level, Morton also contrasts the effeminate form of the ribbons with the deadly contents to which they refer; in this peculiar arrangement, Morton also seems to suggest cautionary advice about underestimating the power of so-called feminine forms. Morton’s embrace of the decorative, craft-like, and lowbrow forms of visual culture can also be tied to a formative anecdote. Her first Celastic work, Bake Sale (1974) (which no longer exists), was a direct response to a male faculty member at the Philadelphia College of Art, who stated that women should stick to bake sales rather than pursue careers as artists. Having herself made the decision to pursue art later in life (Morton was thirty years old, married with three children when she finished her BFA) and leaving her marriage to focus on making art, Morton was steadfast and determined to push back against such gender-oppressive attitudes. The clichés and tropes of femininity within craft-based and “less serious” forms of culture presented themselves as rich subject matter for Morton to probe and undo. As such, her penchant for pattern and decoration may be interpreted as a direct response to the rigid systems of modernism, Minimalism, and other male-dominated and defined realms of culture. However evident, Morton’s use of the “effeminate” is not meant to simply elevate or uphold passé notions of binary gender, but is rather a sustained effort to imbue her works with a subversiveness that reveals an ambivalence toward the feminism of her time. Created at a moment when female artists, especially those concerned with the goals of feminism, were largely exploring the possibilities of a “female art,” Morton’s work is not simply an answer to the question at hand, but can also be read as an investigation of the forms that have historically been relegated to less serious and female realms of culture. Like much of Morton’s work, her last Celastic installation, Signs of Love (1976), is aggressively feminine, revealing a pathos of frustration toward the constraints of gender, as well as definitions of “good” and “bad” taste. Signs of Love is full of sublimated messages and allegorical jabs at “good” (the ladder to enlightenment) and “womanly” (garlands of flowers) symbols. Her tableau, in this iteration, is compressed and abundant. Based on archival images of the work installed in Morton’s studio, her interest in expanding the bounds of sculpture, using all the space from the wall to the floor is evident. The roses, bows, and words that permeate the installation are objects Morton had been investigating for nearly a decade, bringing them into a final dialogue with one another—bringing the feminine to excess. These signs and symbols reveal her interest in the semiotic and the poetic as tools for expanding our notions of objects that are often simplified or taken for granted. Words such as “Poses,” “Atmospheres,” and “Gestures” are set against rosebuds, garlands, and a recreation of Renaissance wedding portraits, acting as a personal lexicon for Morton’s pointedly ironic sense of humor and grave concern for deconstructing the language (both literal and formal) of contemporary art to reveal its biases.